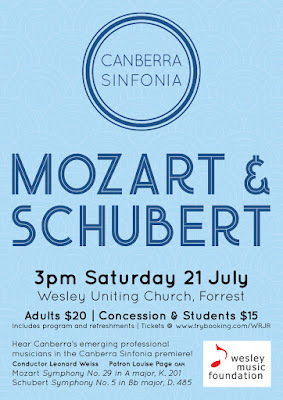 Canberra Sinfonia’s inaugural concert of two symphonies by Mozart and Schubert displayed the high standard of young talent in Canberra’s classical music arena. Patron, singer Louise Page, stated in the program that ‘one of the hardest times in a young musician’s life is bridging the gap between student training and employment with an established musical body’. 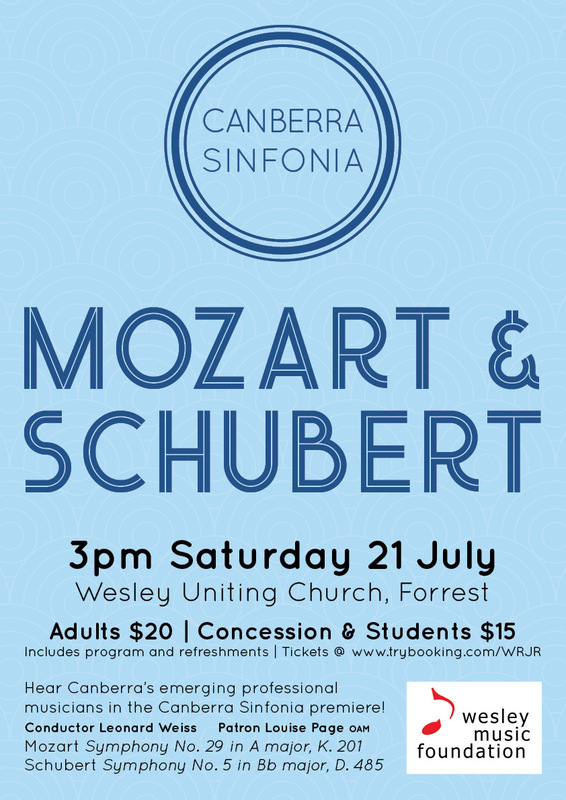 Canberra Sinfonia has been created to help bridge that gap and, under the baton of conductor Leonard Weiss, 20 very capable young musicians played the first concert at the Wesley Uniting Church in Forrest to an almost full house of music lovers. Well-conducted by Leonard Weiss, the program commenced with Mozart’s Symphony No. 29 in A, composed in 1774 when Mozart was only 18 years of age. The Sinfonia gave the first movement a strong start, playing with confidence and producing a pleasing sound. They gave the melodic and reflective second movement charming warmth. There was a bold sharpness and energy in the playing of the third movement that then carried over into the enjoyably dramatic finale. In the second half of the program, the Sinfonia played Schubert’s delightful Symphony No. 5 in B Flat which was composed in 1816 when Schubert was only 19 years old. It contains fine sensitive melodies that repeat and sweep you along throughout the work. The harmonies in the second movement were especially well-played and the Sinfonia gave the third movement a lush, romantic feeling that was full of colour. The finale was played with vitality and accuracy – a fine ending to a very enjoyable concert. It was appropriate that this new group of young players should choose two works by the composers that were written while they themselves were young. It was a fine first concert and it was clear that the Sinfonia will go from strength to strength in the future. Len Power’s reviews are also broadcast in his ‘On Stage’ performing arts radio program on Mondays and Wednesdays from 3.30pm on Artsound FM 92.7. JOHN CAMERON MITCHELL - "The Origin of Love"